This is the current Default PT setup - The reason I made this one is to ensure we have the right jobs available to us. This list is based of the people who attended run #1 and as such is subject to change. Basically this is how we form up our parties. Top name in the group is the Party Leader. This should make the startup for each run go smoothly and efficient. As seen above, some people have key roles for the runs. To be further specific, theese Names are in question. Warrior's - Miemo, Kiskara, Lynxx, Dherax, Slyfer. Function as Main assist and Puller for their party's. Tomahawk Warriors - Miemo, Kiskara, Lynxx. Angon Dragoons - Miledy, Xelestria. Chainspell Stunners - Vadac, Bagira, Chuchundra. NM Hunter - Bustedhurricane. Will find and pull the add NM in each wing. Main Sleepers - Are the bard's assigned to party 1, 3 and 4. Currently Xtrax, Mamoan, Tomvic. It is important theese 3 focus on making sleeping their Main priority. BLM - If the mob's allow it, they will help with sleeping. And also will focus on aiding the center area by Nuking mobs being fought. They will not take down their own mob. Before engaging the Main Boss. All Bards will at a given time use their 2 hour abilities. All melee party's will have Madrigal x2, March x2 and Minuet x2. 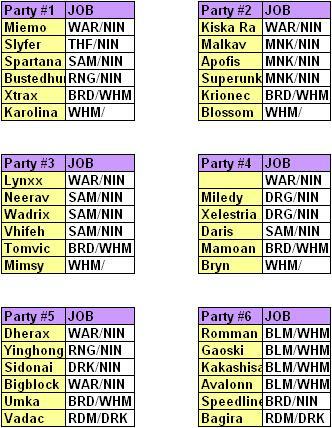 Xtrax - Minuet on all Melee party. Krionec - March on all Melee party. Mamoan - Madrigal on all Melee party. Tomvic and Speedline - Will be invited to Melee partys to speed up the process. You need to use the song the party is lacking. It's extra important for you 2 to keep an eye on the LS log. And buff with whatever song is needed. <Miemo> 2/3 - Minuet, March. <Miemo> 3/3 - Minuet, March, Madrigal. Also it is important for the Party Leaders - Miemo, Kiskara, Lynxx, Dherax, Recluse. To invite the Bard they need asap. Time Frame for this is ~ 1 minute, then we need to engage the boss to keep all buffs up. Also this picture shows where your party is supposed to be when we enter the arena. This is the current PT - Setup. There is one spot "open" in party #4. What we need there is a PT leader - that is a WAR/NIN. We would like to wish Recluse a great future outside of FFXI - and also thank him for the time spent with us. - Makes sure all are inside the arena when we start. - Are assists for their party's. - Are to position their party at their "spot". - Are part of a "evaluation group" who annalyze each run and high-light's areas of improvement. If you feel you are what we are looking for send Miemo a /tell in game.